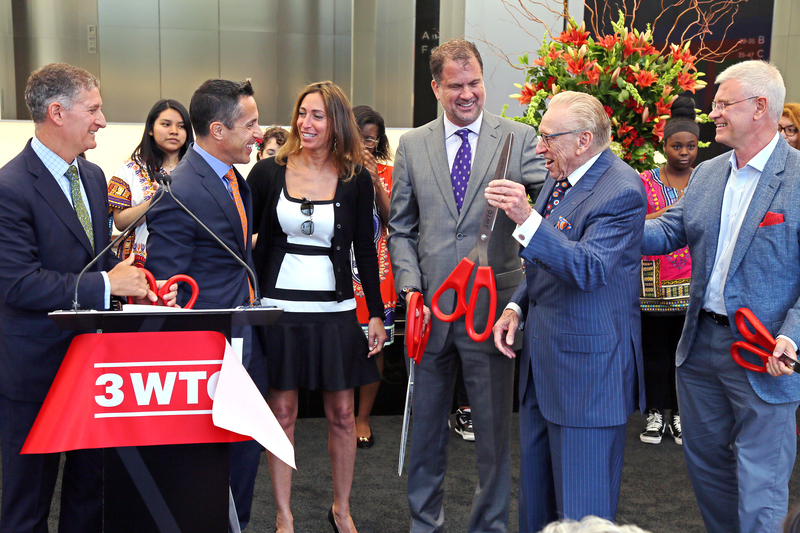 A ribbon-cutting ceremony hosted in the building’s cavernous, triple-height lobby on Monday marked the end of a grueling and, at times, adversarial development process. It also added another chapter’s distance from the terrorist attacks of September 11, 2001, to the annals of New York history. However, after the speeches ended and the last bit of ribbon fell, Silverstein Properties and the project’s leasing agency, CBRE, still faced the daunting task of filling nearly 1.5 million s/f of office space and 150,000 s/f of retail within the shimmering tower of glass and stainless steel, while also trying to find an anchor tenant that will allow them to start work on the site’s final tower: 2 World Trade Center. Less than 40 percent of 3 World Trade has been leased to date, as the first occupants prepare to move in next month. However, with the veil of construction lifted, the project’s head leasing agent Mary Ann Tighe said seeing will be believing for prospective tenants. “People can be smart in every way but not necessarily visually imaginative; it’s a different kind of intelligence,” the CBRE CEO said. Standing 80 stories tall, the ultra-modern office tower has 2.4 million s/f of office space, of which approximately 950,000 s/f has been leased. Three companies, GroupM, McKinsey and IEX, account for nearly 98 percent of the taken space. The building also has five retail floors and, so far, not one tenant. Like Towers 1 and 4, Tighe attributed 3 World Trade Center’s sluggish pre-construction leasing to a disconnect between how the building and area looked then versus what they would become upon completion. Getting people to see the area as more than a construction zone — or worse yet, the site of a national tragedy — has not always been easy. To her point, Tighe said 4 World Trade Center, where she also leads leasing, recently hit full occupancy and it is her understanding that 1 World Trade, which is represented by Newmark Knight Frank, is entering the home stretch as well. The success of those projects combined with the Financial District’s rise as a mixed-use neighborhood with a close proximity to highly-coveted talent pools figure to make 3 World Trade an easier sell moving forward, Tighe said, noting the emphasis most companies are placing on hiring. “You need people who are tech savvy, you need people who are creative,” she said. “The challenges of getting talent are enormous. I believe the connectivity of Downtown with the most robust residential markets for that talent is its magic. Initially slated for a six-year build out, 3 World Trade broke ground in 2008. The Great Recession led to squabbles between Silverstein, the Port Authority, which owns the land beneath the World Trade Center, and the various other parties involved over the development’s size, scope and price tag. In 2012, the Port Authority threatened to cap the building at seven stories if Silverstein couldn’t secure an anchor tenant to occupy at least 400,000 s/f. The project was saved when, later that year, the marketing network GroupM signed on for half a million s/f at the building before eventually expanding its footprint to 700,000 s/f throughout nine floors. Kelly Clark, global CEO for GroupM, said his company chose to move its world headquarters to the 1,079-foot tall tower because it believed the environment would help the enterprise grow. Clark also noted that he was “humbled to play a small role” in the rebirth of the World Trade Center campus, a sentiment echoed by several of the speakers who addressed the crowd of several hundred suit-clad attendees on Monday. Much praise was given to Silverstein for standing up to detractors and starring down a sometimes dire financial outlook at the property. Along with seeking tenants for the remaining floors of 3 World Trade, Tighe and company also are on the hunt for an anchor tenant for Tower 2, which will be the second tallest building in the district at 1,340 feet tall with 2.8 million s/f of office space. Tighe said the anchor tenant will have to sign on for at least 800,000 s/f before construction can begin, which she said is no small task. However, given the current business market and the rapid progress being made in the surrounding area, she remains confident such a tenant can be found.